Like all living creatures, guinea pigs eventually must come to the end of their life. Depending on the breed, you can expect your cavy to reach an average life span of 5 to 8 years. 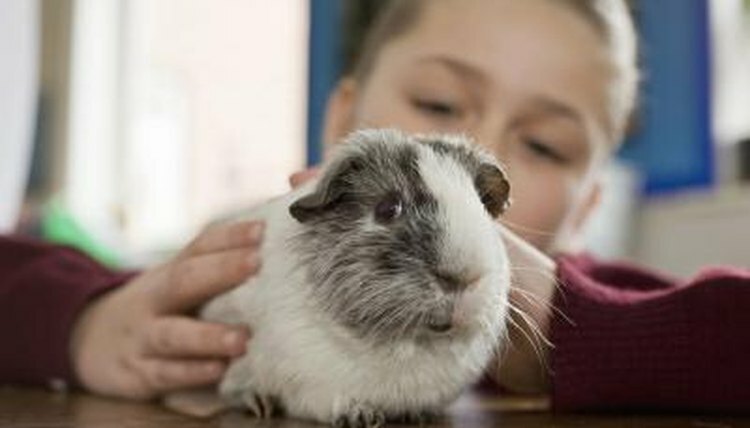 By recognizing the signs of aging, as well as common health issues associated with older guinea pigs, you will be better prepared to help keep your furry friend as healthy and comfortable as possible. A guinea pig's life span is affected by various factors. Genes are the first to be considered; for example, the silky haired Peruvian guinea pig can live up to 12 to 14 years, while the hairless breeds may live only 3 to 5 years. However, environment and diet also will affect how long an individual cavy lives. Environmental factors include the cleanliness of the cage, amount of exercise and level of stress. A guinea pig's diet must be balanced with foods rich in vitamin C, as the animal cannot produce this vitamin on his own. One of the first signs of aging in a guinea pig is graying fur, noticeably around the mouth and nose. At about 4 to 5 years of age, the pace at which your cavy moves will begin to slow down. She may not be as playful as she once was and will rest more often. If it seems that all she does is sleep, and especially if she does not eat at all, take your guinea pig to be checked out by a veterinarian. An older cavy's toes will thicken and twist outwardly as he ages. This discourages the guinea pig from exercising, which can cause poor circulation and eventually bumblefoot, or pododermatitis. Bumblefoot is a painful infection of the foot pad that may be accompanied by swelling or bleeding. Take your cavy to the vet as soon as possible to begin treatment. Older guinea pigs face health issues similar to what humans experience. They can suffer from cataracts, where the eyes appear cloudy, arthritis, stroke and heart attacks. Observe your cavy daily and keep an eye out for tumors in the form of bumps and growths on the body. Also take note that these are not death sentences, but treatable ailments that should not be ignored. A visit to the veterinarian will improve the quality of life for your aging guinea pig. Always consult an experienced veterinarian regarding the health and treatment of your pet. SmallAnimalChannel.com: What Happens as Guinea Pigs Age?